If you (like me) are fond of digging through bargain boxes at your local comic shop, trying to find those nuggets of comic gold among the Longbox Junk, then you have more than likely spotted at least one issue of this four part mini. As far as I know, those shiny hologram-enhanced covers are as much a fixture of dollar bins as anything Image ever put out during their "Gotta be like Marvel!" 90's Heyday. They must have printed a billion issues of this series because I come across them all the time. So let's take a closer look at this common Longbox Junk find. . .
What we have here is actually a pretty interesting effort on the part of DC to make a sidekick into a hero in his own right. Previous Robins had sort of fallen into the job. DC wanted to build Tim Drake into not just a sidekick, but into a PARTNER for Batman. . .and judging from the ongoing (to this very day) popularity of the character, they succeeded. 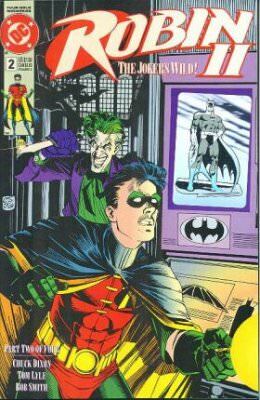 This mini takes place during the very early days of Tim Drake's time as Robin. It places him on his own for the first time and forced to face Batman's greatest villain with very little help. . .a brilliant move on the part of DC to separate Robin (Batman sidekick) from Robin (High-Tech Detective). So the IDEA is a good one. . .how did the EXECUTION of that idea work out? Let's take a look! THE FUNNIEST THING HAPPENED. . . While Batman is out of the country, leaving Robin behind to patrol Gotham alone, The Joker breaks out of Arkham Asylum. After killing (!?) Mr. Freeze, Joker kidnaps a computer scientist and escapes Robin, who was investigating the scientist as a possible lead. Robin realizes that the only thing that keeps Joker somewhat under control is Batman, so he decides to try and convince Joker Batman is still in Gotham. Overall, I found this first issue to be fairly bland. It had interesting spots here and there. . .Robin choosing his nerd friends over the cool kids. . .Joker killing a pre-Batman Animated Series Sympathetic Mister Freeze. . .Joker's surprise turning to rage when he sees Robin the first time (Not realizing it isn't Jason Todd). . .Robin having to be driven around in a van by Alfred. But other than those few good moments, the story here is pretty predictable and forgettable. The art is pretty good, but suffers a bit from "The 90's" with X-TREME spiky hairdos and elongated legs. The artist has a hard time with vehicles, backgrounds are pretty sparse, and the colors are garish in places. But that said, it's not as full-on 90's craptacular as it COULD be. It's right on the border of good and bad. All in all, this first issue serves as a decent setup with a few good moments in the story and pretty good art. Unfortunately, it's walking a 90's tightrope and all it's going to take is one bad step. 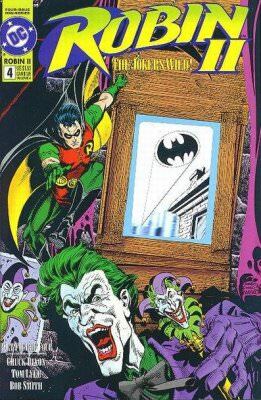 . .
As Robin continues his solo patrols of Gotham, using a holographic projector to convince Gotham's underworld that Batman is still in town, The Joker begins to put his plan to take the city hostage in place. This second issue is mostly setup for things to come. It slumps a bit as pieces are moved into place without much resolution. The art continues to teeter on the edge of 90's-Tastic and 90's-Terrible with some pretty good scenes of Robin on patrol, and some pretty bad backgrounds and garish colors. Overall, this issue is a little better than the first one, but not by much. This mini is still just BARELY staying on the rails. . . .A COMEDY TONIGHT! Joker disrupts Gotham's computers and throws the city into chaos. His ransom demand for a billion dollars cash in a truck driven by Batman lets Robin know that Joker has called his bluff and knows that Batman isn't in town. This setup for the final issue begins to pick up the pace as Joker realizes that Batman is gone and calls Robin's bluff. 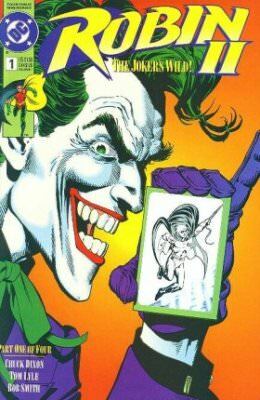 The scheme is technology-based (Joker controlling the city's computer systems), so Robin's hacking efforts and a lot of the jargon in this issue have not aged well at all, making this story feel somewhat like a relic of another time. 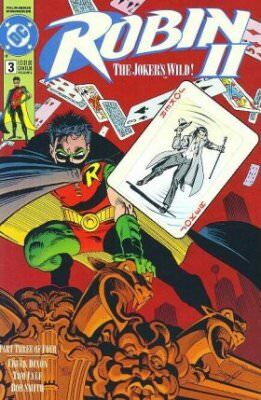 Robin puts a plan to trap the Joker by using his own game against him into motion, and barely survives the encounter when he finally draws the madman out. And here we are at the big finish! Robin baits his trap while Alfred and the GCPD track down Joker's brainwashed computer scientist, and it ends with a decent fight scene and Joker getting kicked into a sewage tank. Once again, the extremely outdated technical aspects of the story bog it down, with Alfred jumping from payphone to payphone hooking up dial-up modems to try to track Joker's hideout down. Reading the computer-heavy parts of this story is pretty bad. The rest of it is pretty typical "punch the bad guy and WIN!" comic book fare. To tell the truth, that part hasn't really aged gracefully either. Overall, this issue wraps everything up nicely, but it leaves a dusty old taste in my mouth. The legacy of Tim Drake as an extremely popular character continues to this day, and this mini was an early part of the effort by DC to make him not just another sidekick, but a hero in his own right. . .so in that way this mini is an interesting part of comic history and worth a read. Unfortunately, beyond that, what we have is an extremely dusty relic of the 90's. The high-tech jargon of 1991 that set Tim Drake apart as a "modern" hero on the cutting edge of technology is hopelessly outdated to a modern reading. Underneath the outdated computer trappings is a pretty average story about Joker escaping and coming up with a mad plan to take Gotham hostage, then being foiled by Robin turning his own game against him. It's the same kind of story that's been played out over and over again, it's just that the hero is different in this case. Ultimately, this mini is pretty forgettable. It's interesting as a look back at the beginning of a popular character, but other than that there's not really anything I can point at that elevates this story beyond average at best. It's a really common find in bargain boxes, and I can see why. I was working at a comic book store while this series was on sale. It sold very well due to the popularity of Robin III (aka Tim Drake). Me thinks a lot of comic book collectors wanted anything with a hologram on the cover at the time too (Idiots!). You are correct in saying that it really is a forgettable mini.